Egyptian representative Masry will continue their Confederation Cup campaign on Friday when they face Gabonese side Mounana in Libreville in the tournament's round of 32 (second round). The Gabonese side went to the Confederation Cup after being eliminated from the African Champions League at the hands of Egyptian giants Ahly after slumping to a heavy 7-1 defeat on aggregate to the eight-time African champions. "Our objective is to go as far as possible in the Confederation Cup," Masry's coach Hossam Hassan told the CAF official website on Thursday. "Mounana is a good team and we have to forget their result against Ahly." Masry reached the round of 32 at the expense of Tanzanian side Simba on the away goal rule following a 2-2 aggregate draw. They played out an exciting 2-2 draw in Dar Assalam before settling for a goalless stalemate at home in the second leg to advance. 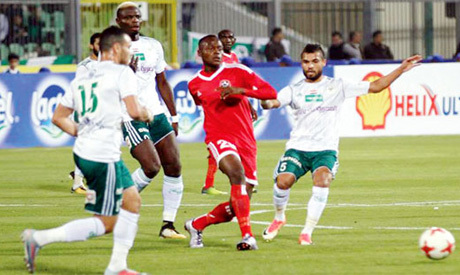 Despite their African success, Masry slumped to a surprising 2-0 defeat to Ittihad of Alexandria earlier this week, losing three precious points in their race for second place in the domestic league, but the team's football director Ibrahim Hassan said that his side put the domestic league behind them and are focusing now on the African tournament. Masry are Egypt's sole representative at the Confederation after the early elimination of Zamalek, who were ousted from the competition in its first round after losing to Wolaitta Dicha of Ethiopia on penalties. The second leg will take place in Port Said on 17-18 April. Masry are eyeing the first African triumph in their 98-year history.